This year marks the 80th anniversary of the first NCAA tournament, and is the final season in the 2010s. That made us wonder: Which teams are the best in every decade since the NCAA tournament started? We looked at the records and championship performance of every Division I team for every decade since the NCAA tournament started in 1939, and combined those statistics to find the top three teams for each. There are teams with better records that didn’t make the top three because of poor or nonexistent championship performance, and other teams with one or two championships in the decade, but overall records that fall well below the third place team. The only team to win an NCAA tournament in the 1930s was Oregon, which captured the inaugural championship in 1939. But the Webfoots were a pedestrian 179-105 (.630) through the decade. Instead, it was LIU Brooklyn that was the powerhouse of the 30s. The Blackbirds had two undefeated seasons (1935-36 and 1938-39) under coach Clair Bee, who holds the best win-loss percentage for any college coach with more than 500 games, at .824. In 1939, LIU Brooklyn chose to go to the NIT instead of the NCAA tournament, where they beat Loyola 44-32 for the championship. Kentucky Athletics Kentucky coach Adolph Rupp (first row, left) and his 1949 national championship team. In 1930, Kentucky hired a high school coach from Illinois named Adolph Rupp to lead the Wildcats. Rupp would win 876 games in 41 years with Kentucky, and more of those came in the 40s than any other decade. In 1948, Rupp led the Wildcats to a 36-3 record and their first NCAA championship. They’d go back-to-back in 1949. Kentucky Athletics The 1958 Kentucky basketball team would win coach Adolph Rupp his fourth (and final) national championship. The Wildcats had a tumultuous start to the 50s. After winning their third title in four years with a championship in 1951, repercussions from a point-shaving scandal caused Kentucky to cancel the entire 1952-53 season. The following year, Kentucky had its only undefeated season under Rupp, and in 1958, Kentucky would win its fourth title — Rupp’s last. A note here on the absence of San Francisco in the 1950s rankings: While the Dons did win back to back championships in 1955 and 1956 with Bill Russell, they also had five seasons under .500 in the decade, and had a winning percentage of .633, which ranked outside the top 20. UCLA Athletics UCLA won its first national championship in 1964 under coach John Wooden (crouched, wearing suit). 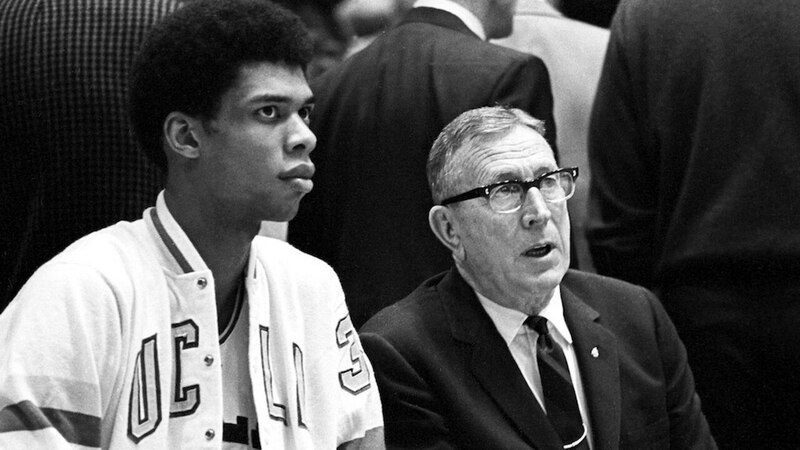 UCLA had never won an NCAA championship when they hired John Wooden in 1948. In the 50s, the Bruins had highlights (a 17-game winning streak and an undefeated conference title), but it wasn’t until 1964 that UCLA would win its first national championship on the backs of an undefeated season. They’d win again in 1965, but in 1966, the Bruins failed to win their conference, so they weren’t invited to the NCAA tournament. In 1967, sophomore Lew Alcindor was finally eligible for the varsity team. In his first game, he scored 56 points — a UCLA single-game record. With him at the center, UCLA would win another championship in 1967. And 1968. And 1969. The continued success led to the construction of a new stadium to hold the now-overflowing crowds: Pauley Pavilion. UCLA Athletics UCLA's 1975 championship — its 10th in 12 years — would be coach John Wooden's last, as he retired after the game. UCLA picked up where it left off in the new decade. And then some. In the '70s, the Bruins became the only team ever to win at least 90 percent of their games in a decade. The Bruins would go on an 88-game winning streak from 1971 to 1974 — still an NCAA record by 28 games — picking up three more titles in that span to make it seven in a row. But in 1975, after advancing to the NCAA title game for the 10th time in 12 seasons, Wooden announced that he would retire after the championship. The Bruins sent him off in style, beating Kentucky 92-85. James Worthy, Michael Jordan, Dean Smith. When you have two Naismith Hall of Famers on a team coached by another, good things are bound to happen. In the ‘80s, UNC continued a streak of what would be 37 straight winning seasons (from 1964 to 2001) and a streak of 27 straight NCAA tournaments (from 1975 to 2001). The Tar Heels made the Sweet Sixteen every single year this decade, advanced to back-to-back championships, and won Smith’s first title in 1982. Kentucky of the 1990s might be best known for losing a game in the NCAA tournament, thanks to Duke star Christian Laettner’s buzzer beating shot. But Kentucky did win two championships of its own. In 1996, the Rick Pitino-led Wildcats went 34-2 and beat Syracuse 76-67. In 1997, they made the championship game again, but fell by five to Arizona in overtime. In 1998, under rookie coach Tubby Smith, Kentucky had its lowest preseason rank since 1991, but went 35-4 en route to the school’s seventh national title. At the start of the millennium, fresh coach Billy Donovan took Florida to just its second Final Four ever, and its first national championship in program history. The Gators would lose to the favored Michigan State Spartans, but Florida would make the NCAA tournament in each of the next seven years. In 2006, they finally broke through, winning their first-ever championship. In 2007, Florida returned all five starters (including Corey Brewer, Al Horford, and Joakim Noah), and became the first team since Duke in 1991-92 to go back-to-back, a feat no team since has done. In a decade that isn’t over yet, Duke has seen two Final Fours, two championships, and Coach Mike Krzyzewski’s 1,000th career win. The Blue Devils have been ranked in the preseason Top 10 every single year, and come in No. 1 three times. That’s translated to at least 25 wins every year this decade.